In Yonezaki refuge, there was no one who wandered around, but there were those who needed assistance in going up the staircases. 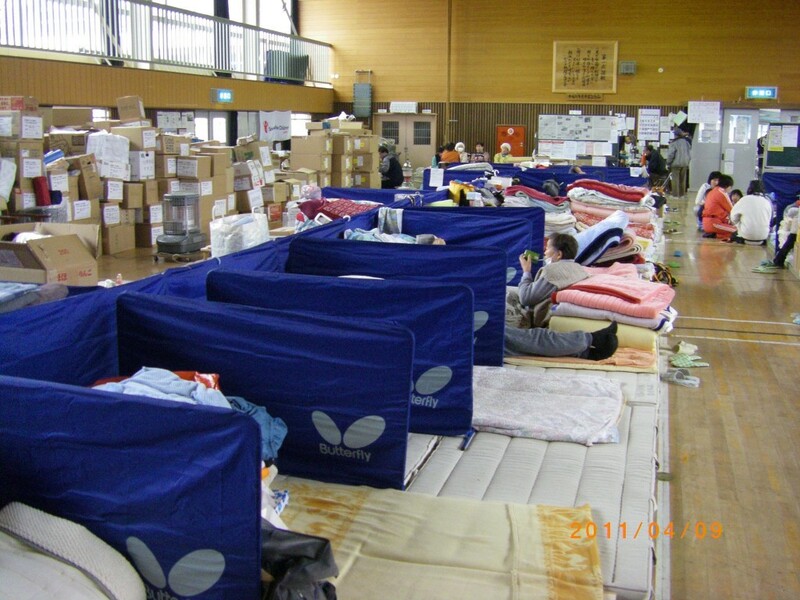 Also at night, there were those who couldn’t find their families’ sleeping areas. Adhering to the principle that everyone should have a duty, one handicapped male was given charge of distributing beverages. Refugees tend to minimize water consumption in order to avoid using bathrooms. So his task was to remind everyone to drink and hand out tea, water, or sports drinks from relief supplies. My son was only a year and a half old when the earthquake occurred, and I personally experienced the difficulty of having an infant in a refuge. As someone has to look after the child all the time, it was stressful not to be able to join and help the work everyone else was doing. During the transition period from milk to food, baby food has to be provided. The cry of a baby is stressful for mothers, as well as for those who don’t have kids. Hence, we rented a room from the school and gathered households with infants, so they could help each other. Households with infants don’t mind babies crying, and they could share powdered milk or diapers. Both powdered milk and diapers were provided via aid, so they belonged to no one, and all were shared according to size or age. Unlike in the gymnasium, where there were sighs and agitation, the children’s room was where angels played. When I got tired, I used to go to the kid’s room to be healed by their voices. It was still winter on March 11th in Rikuzen-takata. The school gymnasium had a really high ceiling, and heat rose upwards without warming the surroundings. I remember people could not sleep at night due to lack of blankets for half a month or so. One of the difficulties in the refuge was pain. There were those who had severe headaches caused by high blood pressure because of stress. Another problem was toothache. In cases of severe headaches we could call an ambulance, but we couldn’t do so for toothache, and there was no information available regarding which dentists were accepting patients. We recognised the importance of regular check-ups. One of the top problems at refuges is lack of space and privacy. With the exception of families with infants, everyone slept in the gymnasium and had a space of 250cm x 80cm. Beside pillows (or feet) there was a small space to put a change of clothes or drinks, but that was it. No small number of people considered their pets as family members, but having pets in the gymnasium could result in many different kinds of trouble. We kindly asked them to keep their pets in their cars or other places. The municipality of Rikuzen-takata was swallowed by the tsunami up to the top floor, and many of its workers went missing. Civil servants are also civilians, meaning they are also victims. However, the municipality had to function for normal duties, the earthquake response as well as confirmation of missing ones, and there was no person to send from the municipality to be in charge of running the refuges. Under such circumstances, people who sought information or help came to the school gymnasium. They were looking for their family members, relief supplies, or some of them complained to us about when the Self Defence Army would come or how the municipality was handling the situation. There were only refugees and no civil workers, nor anyone who had the time and the strength to contact the municipality for those people, so we politely declined. Right after our life in the refuge started, we had no idea how long we could expect to wait for food aid to arrive, so we tried not to use ingredients which could last a long time without perishing. As a result, the contents of meals were unbalanced. What we feared in communal life was food poisoning, so we avoided raw food, and fried meat. Leaf vegetables were limited and couldn’t last long, so we used them whenever we had them. However, vegetables were not delivered every day. There were, naturally, periods when we didn’t have vegetables for the whole week. After two weeks had passed, there was enough food stored, so we started eating fish from cans, and the elderlies were especially happy. It was difficult to choose which food supply to use. There were many of us. We didn’t know how long aid would last. We had large amounts of cup noodles stored but,if consumed by 200 people, they would immediately disappear. And because there were many of us, it took a long time to cook. It required at least two hours to cook and serve each meal. There was no fridge, so on hot days dishes would go bad before served, so we ate cup noodles during the day. Yet another problem was allergies. There was a family who had a child with a gluten allergy. In the early days in the refuge, we had no food to comply with his requirements. People around him started eating some dishes while he could only eat rice balls. We felt very guilty about it but there was nothing we could do. After a few days they moved to their relative’s house. We received various aid concerning meals, so I would like to present some of them. Food was delivered to support us, so I know this sounds rude, but necessary items didn’t arrive at the ideal time and in the ideal amount. We received a lot of cup noodles, as they could be stored for a long time, but in reality, it was not easy to boil water for 200 people. One of our concerns was the lack of seasonings. It is not healthy to eat very salty food, but food with no salt is really not appetizing. At any rate, it was food for 200 people, so the amount of salt, sugar, soy sauce, vinegar, or miso required was the same as in any canteen. With limited seasonings, the choices of dishes that could be cooked was also limited. When volunteers contacted us offering a soup kitchen, we agreed a schedule with them. However, there were several instances when they didn’t arrive. We could have reacted if at least they had informed us that they were not coming, but there was no way to contact them. We only got mobile phone reception back over a month after the earthquake. We were not informed which route they would take or where they were going prior to our refuge, so we couldn’t even go to check up on them. After waiting long hours, we judged they wouldn’t come, and had to ask mothers, who had anticipated their day off, to cook something quick. This happened more than just a few times. Some days later, when we contacted them, we were told that more people had appeared in its neighbourhood, and they had no supply nor time to come over to our refuge. One day, we had a group of volunteers who served us great food; very tasty and a generous amount, and we all felt very fortunate and full for the first time in a long while. However, something was wrong. They didn’t seem to have brought so much food with them when they arrived We realized that all our food supplies, such as leaf vegetables and potatoes, which were already prepared for the next day, were gone. The canned food for the following days was gone, too. They used up all our stocks! We could barely manage to make the daily meals, calculating the amount of food supplies left and planning two to three days in advance. Our staff were highly discouraged to get back on track. On top of that, rare seasonings were also used up. Even though the soup kitchen was an act of good will, one of our members couldn’t help but to shout that they should never come back. Supporters came and emptied our stock of foodstuffs and seasonings, and our plans were forced to change. The shortage of food supplies caused huge disappointment among the cooking group. We had several days of soup with nothing in it, and tasteless dishes. We were very grateful for every piece of aid we received. However, our needs changed as time passed by. In the early days in the refuge, blankets, food, water, cloths, medicine, female sanitary supplies, and heating which required no electricity were needed. After a few days, we needed materials concerning long-term shelter. Rice, canned food, medical masks, pillows, loose clothes (for sleeping), plastic sheeting, for example. After a few more days, shoes (like sneakers), wellingtons (for searching after the tsunami), materials to divide sleeping spaces in the gymnasium, food with a stronger taste, sweets, were wanted to accentuate everyday life. Among what we received, there were unexpected relief supplies. Those who survived through the Kobe and Nigata earthquakes delivered us business card holders, notebooks and pens, markers, large drawing papers, and computers. In the early days we just struggled to survive, but those materials helped us greatly to record or announce management of the refuge. Coffee, beer, cigarettes, TV, comic books, etc were such a luxury that we could not have possibly requested them, but it was great to receive them. Each organization has a field in which they are skilled, and not so skilled. It is only natural that a student organization, which has time and manpower but no money, and a CSR (corporate social responsibility) organization differ in what they can provide. If we knew what area the organization was good in, it was easier for us to make a specific request. For example, the Refugee Support Association, having experience in supporting people in need on a regular basis, came to affected areas immediately to make inquiries. They brought numerous experts in law and finance, as well as in women-specific matters, to engage in resolving issues. 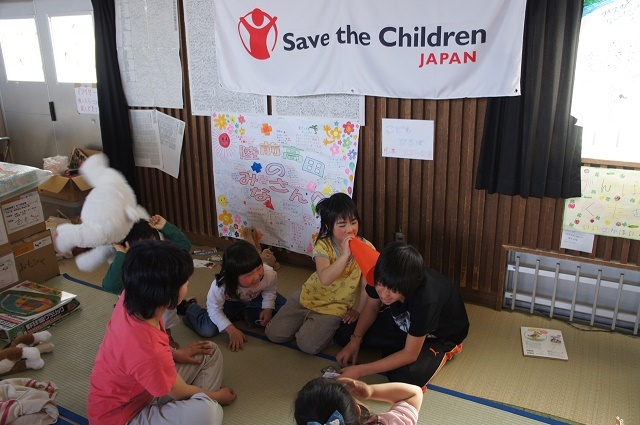 Also, Save the Children Japan came to the Yonezaki Primary School refuge about 10 days after the earthquake, and provided us with materials and volunteers for the children to play with. There were many refuges in the affected areas and one organization could not look after all those places, so children’s support organizations contacted each other and coordinated, as I found out in later days. Other support included sports instructors. They were concerned about refugees, who lack exercise when living in limited spaces and get sick, so they came on a regular basis over a long period to instruct us on exercise. I recall it was easy to cooperate with organizations which had a clear aim in their activities. We received so many kinds of support, but among them there were some slightly “troublesome” ones. On that day, by the time the truck had arrived and unloaded the supplies, there was a long queue of people. But there was no one in charge. No one said to start, nor informed how many items of clothing per person were provided. The first person in the queue was about to take some cloths, but people behind became very anxious. “How many pieces per person? !” “What time does it start! ?” People started shouting. There were some who jumped the queue and the crowding worsened. Though this clothing was not delivered to our gymnasium refuge, we decided to take care of the distribution. “What were you doing! ?” “Hurry up!” “We can’t hear you!” The crowd was in uproar. On the TV and in newspapers, it seems to have been reported that the refugees were well organized, even in time of chaos. That was only the case where there was good management. In other places, once people panicked, it took a lot of effort and time to calm them down. The Active Listening volunteers (non-professionals) caused compliance issues. They came to our refuge and to other temporary housing, where they would volunteer to “provide conversation”. Unfortunately, they would listen to one family, and then tell that family’s whole story to the next family. In the worst cases, they published those stories in their activity reports. Very personal information, such as the panic at the moment of losing family and friends or financial trouble relating to inheritance, was reported in detail. Names were not stated, but we knew whose stories they were. And it was all open to the public. We demanded an immediate suspension of publication, and asked why they would do such a thing. The answer was: because their activities were funded, and detailed reports were required. People who told their private stories didn’t think the information would be leaked. Furthermore, they couldn’t have imagined that people at the same refuge would find out all about it. I strongly wished that whoever coordinated Active Listening would have educated their volunteers before their activities started on what they could or could not tell others. Lastly – who engages in disaster risk reduction? Prior to the Great East Japan Earthquake, the expression “disaster prevention” was commonly used. However, after that, the more widely used term is “disaster risk reduction”. What is the difference between disaster prevention and disaster risk reduction? 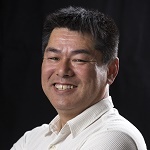 “Disaster prevention” aims to protect lives and properties. “Disaster risk reduction” hopes to protect lives by temporarily giving up on protecting properties. During the Great East Japan Earthquake, there were many people who evacuated initially, but then went home for wallets or a Buddhist mortuary tablet, and never returned. First of all, we have to be aware of the fact that our home is not an absolutely safe place. Homes can provide privacy and we have everything we need there, but the ground on which they stand may not be safe. Around cliffs, rivers, or seas, please find out where your house stands, and where the closest evacuation facilities are. Next, please get rid of ideas that our government or the Self Defence Army will take care of you in cases of disaster. They can’t really do anything. In the case of an earthquake, the Self Defence Army will not prevent your furniture from falling onto you. Lastly, acquire knowledge on weather lore, fix-down furniture, and pay close attention to information on emergency alarms. Weather lore may sound complicated, but when the sky turns dark all of a sudden, anyone would run into shelter or places with roofs. That is the basics of weather lore. Weather lore starts from the moment when you look up at the sky with your family and say, “It seems like it’ll rain, let’s check the weather forecast”. The Great East Japan Earthquake was predicted under the name of “Miyagi offshore earthquake”. So were the epicentral earthquake, Tokai, Tonankai, and Nankai Trough. They are all predicted to come. In the case of an earthquake, please never abandon the option to escape. Instead of thinking, “It’s pointless to run away because a 20m high tsunami might come”, escape even just a little bit. The tsunami may only be two metres high. After the Great East Japan Earthquake, especially among the elderly, I often hear phrases like, “I’m old, so I won’t escape next time.” I would really like them to remember those members of the volunteer fire department, or their neighbours, who risked their own lives in helping those who were too weak to run. Your option of not running away may endanger the lives of others. Disaster risk reduction can make a great contribution when government, local communities, and individuals are all engaged. I want people to realize that the idea of “someone will help us” will expose your family or loved ones to danger. This is a sincere request from a person who has lost very important friends in the Great East Japan Earthquake.